I’m writing this on Thanksgiving Day which means the holiday season is in full swing and tomorrow is Black Friday, one of the busy shopping days of the year. The list below is more of a Cyber Monday list since I am an Amazon fanatic and hate going out on Black Friday. But if you’re reading this on Thanksgiving 2013 or Thanksgiving 2015 the beer gifting guide below still applies for some great gifts for the beer geek in your group! I don’t feel that there are any bad beer glasses unless they have holes in them. I do firmly believe that the right glass will drastically improve your enjoyment of individual styles. That’s why the top 2 items on my list are both proper beer glasses to add to your collection of brewery branded shaker pints. 1. Spiegelau Set ($40 on Amazon) UPDATED – A reader pointed out that Spiegelau has a new set which replaced the lager glass with the IPA glass which can be had on Amazon for $40 as well – Spiegelau makes this killer set for $40 which includes a tulip, Pilsner, Weizen, and lager glass. 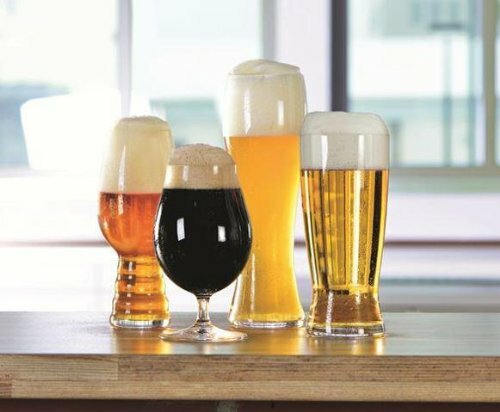 I prefer stouts, IPAs, and sours so I don’t use my Pilsner, Weizen, or lager glasses very often, but the tulip is my default go-to glass for almost any style of beer. If that’s the case for you or the person you’re giving the gift too you can also get 2 tulip glasses for $25 on Amazon. 2. IPA Glass (2 for $20 on Amazon) – If you are an IPA fanatic then forget all the Spiegelau business and get one of these glasses. They make a mind-boggling difference in IPAs. The curved top helps keep the aroma in, the ridged bottom helps keep carbonation going, and that carbonation helps keep both aroma and flavor locked in the liquid. I ended up paying more for the Dogfish Head branded one (here) and the Sierra Nevada one (here) but if I had to get more I’d go for the cheaper, plainer, ones off Amazon.com. I’m a big reader and often try to read 2 or more books at a time, usually one sci-fi book and one science/beer/history book. All of the below are awesome books that I loved reading and would recommend to any beer lover. 3. Tasting Beer ($12) – Randy Mosher’s book is an excellent all over the guide to just about everything you need to know about beer. Especially focusing on different styles, their tastes, and their history. 4. The Audacity of Hops ($15) – This book focuses on the history of American beers and the mighty hop that is the focus of so many beers brewed today. 5. Complete Beer Course ($15 on Amazon) – Like Tasting Beer this book goes through all the various styles and provides tasting notes and examples for you to try. It’s a much more attractive coffee table book than Tasting Beer is but is slightly less informative from a broad beer perspective. 6. Magazines – DRAFT/Beer Advocate/All About Beer – I’ve been getting Beer Advocate and All About Beer for around two years now and have enjoyed most of the issues. All three magazines keep you up to date on brewery openings, beer releases and reviews, and general happenings in the world of American craft beer. I’ve done reviews before on both these products, and the general goal for both is to help keep your beer fresh after the initial opening. 7. Hermetus ($9) – This is a sturdy bottle opener that includes a rubber re-sealer that you can slide on over top of the bottle. 8. Beer Saver ($4 on Amazon) – I only recently discovered these guys but have quickly become a very big fan of them due to their function and portability. They’re barely bigger than a real bottle cap so you can keep them in your pocket and take them with you wherever you go. They are $4 on Amazon right now, but the price seems to vary like mad, and I’ve seen them as high as $10. That’s $4 (or $10) for a 6-pack of Beer Savers so you could buy one pack and split them up if you have several beer enthusiasts in your life. 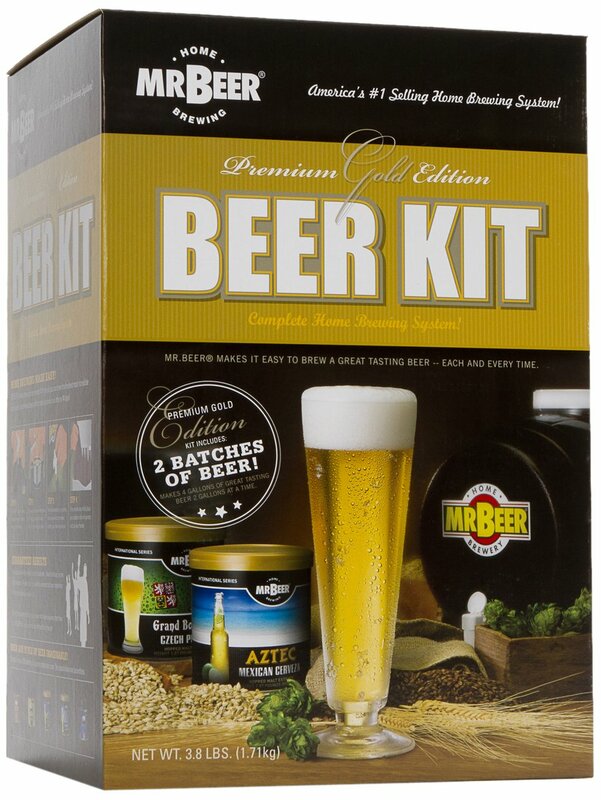 If the beer lover in your life already has everything they could want, then it’s time they get the gift of homebrewing! 9. Home Brewing Kit ($46 on Amazon) – This kit has everything anyone needs to get up and running on homebrewing, just add heat and water. Honestly, I’d recommend you contact your local area homebrew store to have a chat with those guys before buying a kit like this. You’ll likely get better equipment and ingredients and so much info on the process your brain may blow. 10. Zymurgy ($38) – Already a home brewer? Then gift them a membership to the American Homebrewers Association which includes among its many perks a subscription to Zymurgy magazine! You can always get them beer! Bonus # 11. Hooray Beer! ($ – $$$$) – There is a whole wide world of bottle and cans of craft beer out there to get the enthusiast in your life. I’d suggest trying to talk to them to see what styles they like most then heading to your local better bottle shop (Dutch’s, Party Source, O’Bryan’s, Cappy’s, Everything D’Vine, etc…) and talking to the folks there to find something special. If you already know what they want, and they already drink everything around here then head to Craft Shack and order something nice that can’t be bought in Ohio. But hurry up on Craft Shack as shipping takes a while. If you’re still looking for more check out a post by Beer Mumbo, another Cincy blogger & friend of Queen City Drinks, 25 awesome beer gifts 2013 edition Also if you have any suggestions that I missed feel free to leave them in the comments below! I had not heard of this before but it’s going on my wish list now. pine lane goat milk farm here in cincy does some nice beer soaps! I think Spiegalau has updated the ‘Beer Classics’ set to a new ‘Tasting Kit’ set that has replaced the Pilsner Glass with the new IPA glass. Definitely makes it a much better pack. Thanks for pointing that out. That is an amazingly better package and I’ve updated that section of the post. Pingback: Shareworthy Snippets II: Beer Me & A Jewelry Giveaway!